The Seattle Times will present “Endangered Economy: The high cost of climate change” as part of its LiveWire event series on Tuesday, May 17, at 6:30 p.m. at Kane Hall on the University of Washington campus. The Seattle Times LiveWire series features meaningful discussions about vital issues impacting our region and its people. Deputy Director of the University of Washington's Climate Impacts Group, Casola has specialized in climate science and policy for more than 15 years. He served as Program Director for Science and Impacts at the Center for Climate and Energy Solutions in Washington, D.C.
Senior Program Officer of Vulcan, Reeder leads climate and energy work within the philanthropic group, including the Smart City Challenge program with the US DOT. He served as a climate policy strategist within Washington Governor Gregoire’s administration. Sharp is President of the Quinault Indian Nation and the Affiliated Tribes of Northwest Indians, and Vice President for the National Congress of American Indians. She served on Governor Jay Inslee's Climate Emissions Reduction Taskforce (CERT). Executive Director of the Washington Growers League, Gempler is a board member and past president of the National Council of Agricultural Employers, past treasurer of the Washington State Farmworker Housing Trust and a former member of the Food Alliance Stewardship Board. Mapes is the environmental reporter for The Seattle Times and the author of four books, including “Elwha: A River Reborn” and “Witness Tree,” which reveals what a single 100-year old oak tells us about climate change. 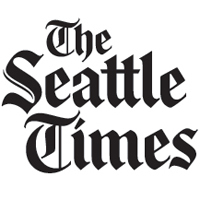 LiveWire is produced by The Seattle Times. Microsoft has been the series’ presenting sponsor since its inception. The University of Washington is the principal sponsor. Additional event-specific sponsorships are available. For information on sponsorships, contact Seattle Times Director of Strategic Partnerships Suzanne Canino at 206.652.6374 or scanino(at)seattletimes.com. Advance tickets are $15, and $20 at the door. Register at livewire.seattletimes.com. The local, independent Seattle Times has served the Northwest with relevant journalism and public service for 120 years and been awarded 10 Pulitzer Prizes as the region’s most trusted news media company. The Seattle Times is one of the last remaining local journalism-based newspapers in the nation’s top 50 cities. It was founded in 1896 by Alden J. Blethen and is now led by the Blethen family’s fourth and fifth generations. The Seattle Times family also includes the Walla Walla Union-Bulletin, the Yakima Herald-Republic, the Issaquah Press, the Newcastle News, the Sammamish Review and the SnoValley Star.